The good news is that a new second hand book shop has opened in Liverpool. It is in the courtyard of the Bluecoat. It is not that new having relocated from Southport but it could be expensive particularly as it is only two minutes walk from Probe Records. I used to be fairly safe when Probe was all the way up Bold Street. It was a good 15 minute walk to get there over lunch. Now that it has moved down more into the centre it dangerously accessible and I am now on saying “Hello” terms. I had already been to the bookshop on the lookout for Christmas presents and I went back in today. They did not have what I was looking for so I went to browse their small section of cookbooks. There was a beautiful Folio Edition Elizabeth David’s Italian Food in its green slipcase, all clean bright pages and wonderful colour illustrations but at £28 I put it to one side. I will have to continue to make do with the very old and dog eared Penguin copy I have already. 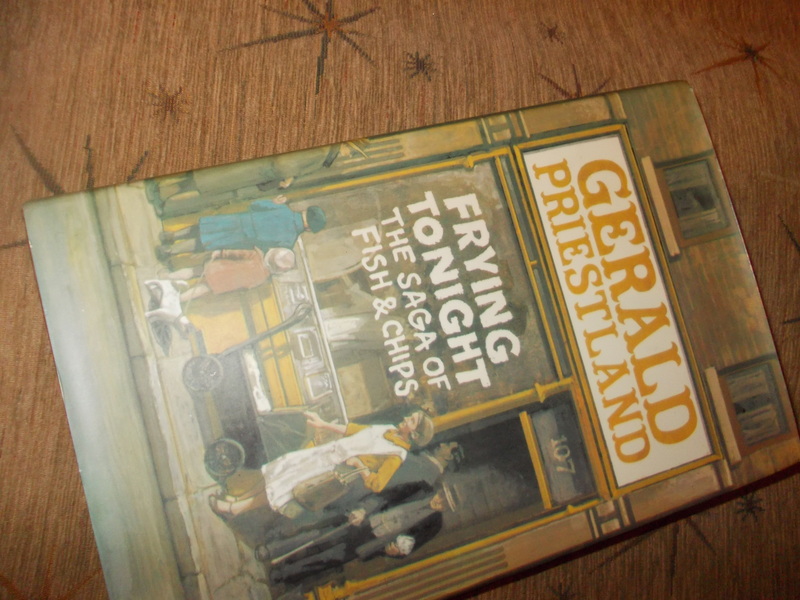 I was then taken by a book called Frying Tonight by Gerald Priestland. Seeing the name on the spine I was half hoping it might be a whole book of cooking around the theme of Carry On Screaming. I was only slightly disappointed to find that it was in The Saga of Fish & Chips, a history of the Friers Trade and our great Proletarian Finger Food published in 1972 with a great many black and white photos of people tucking into healthy looking platefuls of fish & chips. There is a slight folorn photo of a Mr Stratis of Myddleton Quality Fish Bar, Bowes Park, London tucking into a plate of his own wares. The final photo is of the original Harry Ramsden’s kitchen in 1972. I can remember going to the restaurant on a run out from Leeds 25 years ago and sitting on the tables outside to eat our Fish & Chips. In Chapter 3 Gerald Priestland describes a trip to Leeds to visit the head offices of The National Federation Of Fish Friers and publishers of The Fish Friers Review. Pleasingly there is still a Federation of Fish Friers and if you want they publish an official guide to the country’s to Fish & Chip Shops. On good Northern Foods I should also recommend The Tripe Marketing Board who will welcome you with open arms if you join their Facebook page. Looking for an inexpensive and nutritious food that’s rich in vitamins and high in protein – but not too fussy about the taste? Step this way! I have never tried tripe but I am tempted now!